With the continued rapid growth of the wind energy industry, wind turbine interference with weather radar is an issue in Canada, and one which has been recognized by the international community, including by the World Wind Energy Association, the International Telecommunications Union, the World Meteorological Organization and EUMETNET. It is generally accepted by these organizations that this issue can be addressed through judicious siting of the two systems. Why are meteorological weather radars important? Weather radars are one of the key tools used by ECCC’s meteorologists for the detection, short-term prediction and warning of impending severe weather. In addition to the important data supplied by weather radars, meteorologists use a variety of other tools to collect and analyze weather and environmental data including satellite images, surface weather stations, lightning detectors, and sophisticated computer models, as well as a network of weather watchers on the ground to detect and predict severe weather. How do meteorological radars work? Weather radars transmit short pulses of energy out into the atmosphere. The narrow pulsed radio-frequency beam emitted from the weather radar sweeps the sky 360 degrees around the radar site, pointing at different elevation angles typically from zero degrees to about 24 degrees in elevation. The scans at the lowest elevation angles are the most beneficial for detecting the weather at a distance. 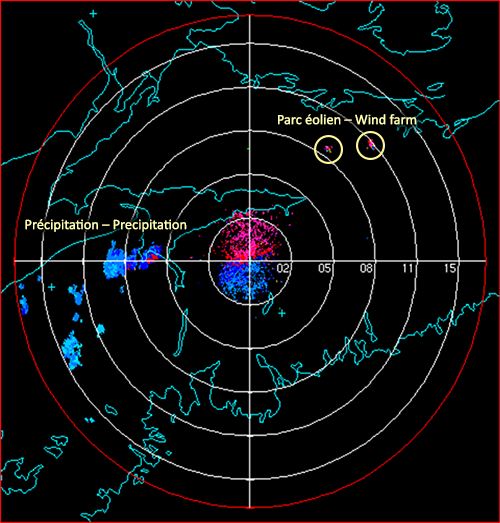 The energy emitted from the radar antenna strikes particles of precipitation, such as drops of water, snowflakes, hail and ice pellets, and a portion of that energy is reflected back to the radar. The measured energy provides information on the location and intensity of the target. The intensity of this energy (or “reflectivity”) is related to the number, size and type of the precipitation particles. Figure 1: How weather radar works, including visual representation of radar’s Line of Sight (RLOS). How do wind turbines affect meteorological radar? The quality of the data received by the weather radars can be affected by many objects. Stationary objects that have zero velocity, such as buildings, mountains, trees and terrain, may block signals, which could result in the loss of the meteorological information behind the object (e.g., data indicating intensity of thunderstorm). The Doppler capability of the ECCC radars is typically able to identify and filter out this stationary blockage. However, the presence of wind turbines poses new challenges to weather radars due to their rotating blades. The rotating blades of wind turbines can impact meteorological radar in several ways ranging from contamination of the quality of the radar data to loss of meteorological data. More specifically, the presence of wind turbines in the radar’s Line of Sight (RLOS) can create the following types of interference with weather radar data: blockage, reflectivity, multi-path scattering and clutter, which have been well-documented by academia and the international meteorological community, based on studies and experiences in other countries. Radar beam blocking is the most serious effect that wind turbines have on radar. Wind turbines are tall structures composed of a fixed tower and multiple rotating blades. If the wind turbines are located close enough to the radar, the tower could cause “blockage” meaning the radar is unable to “see” weather behind the turbine because it blocks the pulses of energy. Even partial blockage can severely affect the radar’s operational capability (e.g. storm/snow fall detection rate and lower level wind shear), which can in turn cause extreme weather conditions to go undetected. Wind turbines can also cause “reflectivity” contamination. The rotating blades of wind turbines constantly change their orientation based on the wind direction, which can be detected by the Doppler radar as an object with velocity. Thus, the signals returned to the radar by the wind turbines cannot be filtered out in the same way as the reflections from the stationary objects (i.e. building, mountains). Such false information can be significantly misleading for forecasters under storm conditions. Numerous reflections from multiple wind turbines may appear similar to heavy or severe precipitation. Similarly, the low elevation radial velocity data received from radar is typically used by forecasters to determine the prevailing wind direction or to track a storm, which can be a key predictor of tornados. Wind turbine rotating blades can impact a weather radar’s ability to detect this low level rotation. When turbines are clustered, a radar signal can be reflected between multiple turbines before it returns back to the radar. The radar processor determines the location of a target by how long it takes the signal to return. The extra reflected targets from the turbine blades cause the radar processor to create false signals. These multiple reflections appear as the radial spikes of reflectivity on a radar image and can cause data contamination many kilometers beyond the wind farm. The result will be the appearance of more precipitation than is actually present. Clutter is defined as unwanted echoes or reflected energy from wind turbines. The impact of clutter depends on the radar cross section (RCS) of the supporting structure, the nacelles and the cross section area of the rotating blades, which in turn, depends on the orientation of the turbine. The turbine can rotate 360 degrees azimuthally in order to align itself with the prevailing wind direction, changing the RCS, with a maximum possible RCS approximately equal to that of a 747 aircraft. Therefore, the energy reflected back to the radar system appears as clutter on the radar image, contaminating the reflectivity data.